With the release of OS X Yosemite, Apple has blown a loud raspberry in the direction of law enforcement agencies and data thieves round the world. The reason? The latest version of Apple's operating system for desktops and laptops positively encourages users to turn on full disk encryption, in the shape of FileVault 2. But what's new in OS X Yosemite, is that more users are likely to enable FileVault than ever before—as at installation you have to consciously opt-out of having your hard drive encrypted, rather than opt-in. Of course, computers with encrypted hard drives make it not only harder for law enforcement agencies to unlock their secrets, it also makes life much tougher for data thieves, too. 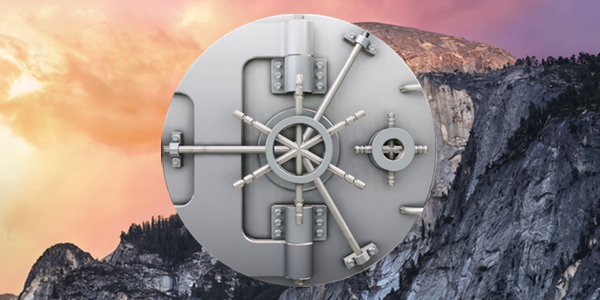 FileVault encrypts your entire hard drive using XTS-AES 128, a secure encryption algorithm. The reason why you should strongly consider enabling the feature on your Macs and MacBooks is if your hard drive isn't fully encrypted, anyone who manages to steal your computer can access any data upon it. 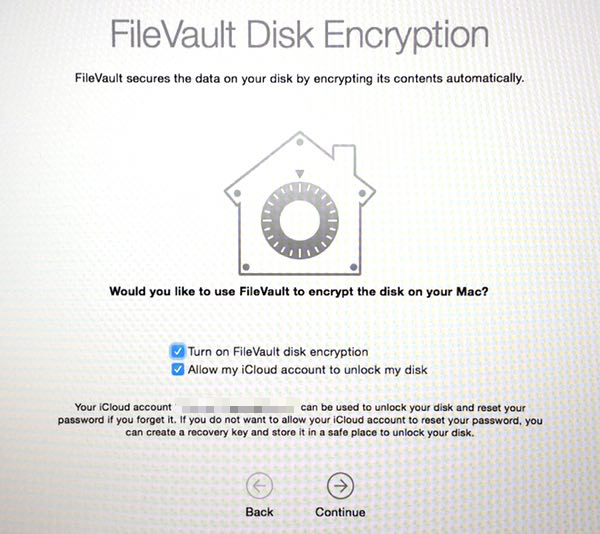 Although FileVault takes a while to initially encrypt your hard drive's contents, you can continue working (and even turn off your computer if you want) during the process. It will just pick up where it left off at the next opportunity. And when your system's hard drive has been entirely encrypted, you shouldn't even notice any difference in behaviour or performance (on a newer Mac at least). As far as you're concerned, the computer acts as normal, your files are accessible as usual without any jiggerypokery, because FileVault 2 is doing all the crafty work invisibly and silently in the background. Encryption that is so seamless it "just works?" That's how it should be. In my opinion, it's a good thing that Apple is better protecting its customers by leaving FileVault enabled by default. If you haven't yet given FileVault a go, it's easy to enable. Make sure you have logged into OS X with an account that has admin privileges, and go to System Preferences > Security & Privacy > FileVault. Once there, press Turn on FileVault. 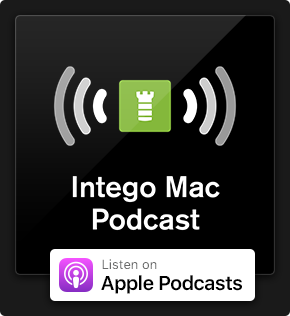 This entry was posted in Apple, Recommended, Security & Privacy and tagged encryption, FBI, FileVault, FileVault 2, government surveillance, iOS 8, OS X, Yosemite. Bookmark the permalink. I’d read somewhere (no, of course I can’t find it now!) that you can hack into a Mac by turning on in Target Disk Mode before reseting the pass in Terminal. FV2 stops this if the Mac is fully shut down but not if it’s sleeping. Can anyone confirm/refute please? Your title is entirely misleading. I just upgraded to Yosemite, and FileVault was not turned on by default. 2. “as soon as your Mac is shut down, its entire drive is encrypted and locked up” I hope not. Surely the drive is encrypted all the time. It is indeed misleading, I had the same experience upgrading to Yosemite (from Yosemite beta) and wasn’t asked by the installer to encrypt, then I realized that my Mac wasn’t in good shape and decided better a clean install (should have done that from the beginning), now I came across the option and of course I agreed to encrypt. this is not new in Yosemite. Apple has offered this even with File Vault on install process for a while. It has been a PITA for Applecare reps as people enabled it without knowing the repercussions. How about some patience? Don’t trust a status bar. It’s done when it’s done. Remember: All your Data has to be encrypted and written back to disk. Your security should be worth it. 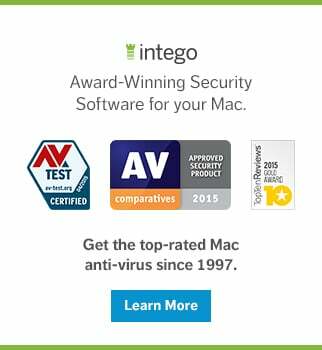 1′ One of my customer have a MacBook Air and I’d upgraded it into Yosemite and FileVault still disactived. 2′ FileVault crypted files when the computer not working, when your Mac working all your files are accessible by you and all software you allow to run. 3″ I bypass FileVault encryption today for another customer, just by booting into single mode. I call BS. If the drive was properly encrypted with FileVault 2, booting single user would give you access to the machine, but the drive itself would have to be mounted using a valid FV2 user and password. Otherwise, it would be unreadable. I was told by Apple that Firevault, required Macbook to run in promiscuous mode, I see a log in console for en3, promiscuous mode enabled succeeded . Anyone know anything about this? I have two questions. Sorry if they seem dumb. First, isn’t the weak spot in the system that your security is only as good as the password protection of the computer? If someone can defeat that, the files are all decrypted as soon as they get past the password protection, right? So how is FileVault actually safer than just good PW protection of the system? Second, how does FV interact with DropBox? If it encrypts my DropBox files, won’t it prevent me from being able to read them from a different system? The login password is used to encrypt the contents of the drive. The password itself is not stored unencrypted, so the only way to decrypt the drive is to know the password (or the master key, but that is not saved unencrypted either). So it’s (currently) not possible to “get past” the password protection without knowing the password. Given a strong enough password, it becomes completely unfeasible to try to decrypt the drive by bruteforcing (by trying different passwords until one matches). FileVault is safer than a normal password login in the way that if someone takes the drive off your computer and connects it to another one, they cannot read anything (because it’s all encrypted). With a normal password login the only protection you get is that they cannot log in, but they can take the drive and read everything on it with a different computer. When you start the computer and input your password, it is used to decrypt the drive. So from then on any files you have are decrypted (until you log out or shut down the computer) and your programs won’t ever see them in their encrypted form. So it won’t affect your DropBox files at all, because DropBox will only ever see the decrypted files. And also File Vault 2’s been easily broken with a $1000 tool since 2012. So not only catastrophically bad, completely useless even when it works. I know you wrote this 3 months ago, however I felt all the misinformation needed to be cleared up for anyone coming across it. 1. You are an exception, not the rule. 99.9% of the time Firevault encrypts without issue. 2. The tool you speak of can only crack encryption if there is a live image in memory. That means someone has to take your mac while it is on. Memory is lost/wiped when it loses power. I am a new apple user. But sins i got my “oldish” laptop i first disabled FV and it was working fine. Then after a month or so enabling it. Still works fine. A lot of you are talking about FileVault 2, is the FileVault that comes standard with Yosemite FileVault2 or am i missing something? In regards to government surveillance. Lets say the FBI wants accesses to my laptop all they have to do is ask apple for my accesses to my icloud as icloud can unlock the encryption? So my basic question is how secure is my icloud account? 1.The encryption key is not on the computer. 2. Everybody should encrypt by default. File Vault do not work on my macbook: When I start OS X i can choose between “Mount my HDD with FileVault Password” and “Admin Account”. So why can I use it without password ? Or is there something wrong with the configuration of it ?